Painting your bathroom and decorating it at the same time during your next makeover will bring new life to an important room in your home where you spend many intimate moments. Your bathroom patin colors should be designed so that it is both functional but also soothing and relaxing. Selecting your bathroom paint color is paramount next to coordinating your choice of fabrics, fixtures, etc. It’s simple to select a color scheme (no more than 3) to coordinate your bathroom décor. You can use the proven and tested 60-30-10 rule. That means 60% of base color, 30% of secondary color and 10% of accent color. These selections are in the eye of the beholder, your eye that is. Let your aesthetic eye guide you in selecting what is pleasing to YOU. If you’re replacing the floor covering, coordinate the color into the 60-30-10 rule as the floor and walls make up most of the base color. After you’ve selected your paint color, ensure that you select the proper type of paint. For Bathrooms, it is recommended that you select a water-resistant paint for walls, ceilings, and trim because it’s washable. Washable paints can be classified as ceramic or acrylic. 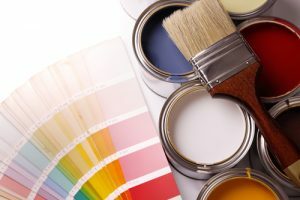 Favorite brands can be located at Sherwin Williams Paint Company, Home Depot, Lowes or Ace Hardware or try requesting it from your local paint store. Using this type of paint makes it easy to wash off stains and discoloration from surfactant leaching. Other names for surfactant leaching are streaking, weeping or exudation, which is a botanical term that refers to a substance secreted by plants. No matter it can be unsightly and you will want to remove it. This is easy to do since you selected to use a ceramic or acrylic washable paint. Here at Fine Line Painting, we are ready to assist you in your next bathroom makeover. Call 734-769-1303 for a free estimate to get you started.